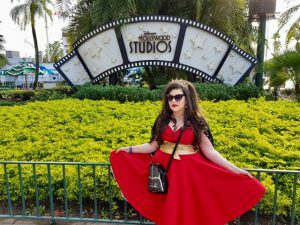 In November, I went Disney bounding for the first time in Walt Disney World Florida. Disney bounding is wearing clothes to replicate a character without being a costume. 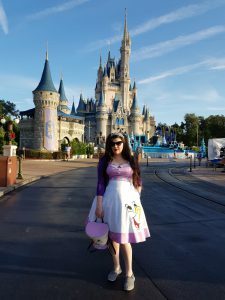 Adults are not allowed wear costumes in Disney (unless it is Halloween) so Disney bounding is a nice way to dress up without getting in any trouble with security. 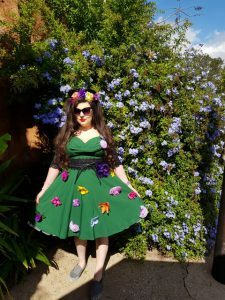 There are a number of ways of doing it and it can be simple, for example, a purple tshirt and green jeans are very Ariel or it can be completely over the top. I chose to go for a vintage theme for all of my looks. As we were travelling to Florida, I couldn’t bring too much with me so my accessories are very limited. I didn’t have a bag for each outfit and for the most part I used my trusty Chip even when he didn’t really work with the character. I also wore my ugly Skechers with all my outfits as we were doing a lot of walking. 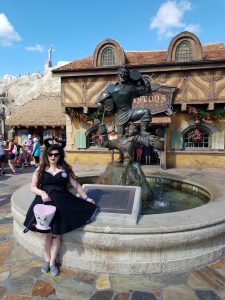 Maleficent was my first Disney bound. I got the horns in Penneys as part of a costume about two years ago. So many people stopped me to ask about the horns. I had a lot of fun in this outfit. Minnie Mouse is a must for bounding as it is relatively easy to do. I put a very light black tshirt with a vintage polka dot skirt and it was light and airy which is always good in Florida because it is roasting. Beauty and the Beast is my favourite film and regular readers will know that I’m ever so slightly obsessed. 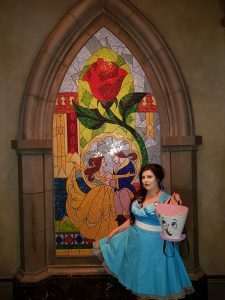 The first of my Beauty and the Beast outfits was Belle’s blue dress. I added a white belt in place of an apron to a blue dress and put a bow in my hair; my Chip bag of courses helped with the look. I met Beast in this outfit and made a total show of myself. He liked my bag and I hugged him (read clung to him) for far too long. 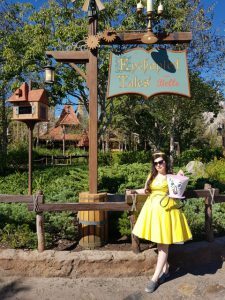 My second Belle look was the yellow ballgown. This dress didn’t really fit me so I had to do a bit of taking in and taking up and overall I don’t think it looked nice on me but I did enjoy having my hair up in the Belle bun. Again, Chip helped me out. 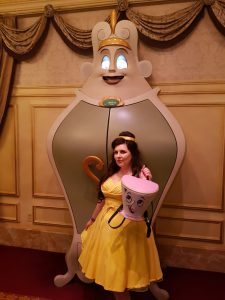 I was invited to meet Belle, along with about 25 children in Enchanted Tales with Belle; I don’t think the poor character knew what to make of the 33 year old maniac that was suddenly in front of her. She told me she liked my outfit and gave me a bookmark. I met Beast in this outfit too and once again made an eejit of myself. 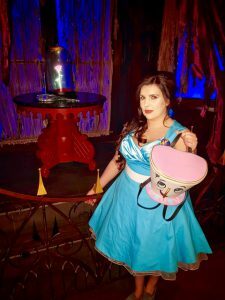 My third Beauty and the Beast look was Chip. 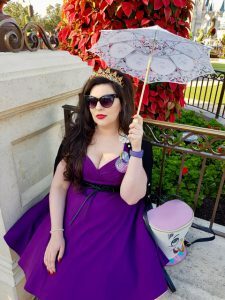 This wasn’t a look I had been planning but I saw the dress in the Magic Kingdom and had to have it. 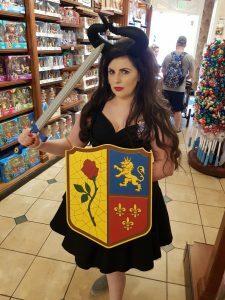 I wore it with a tiara for breakfast in Cinderella Castle and switched to homemade Beauty and the Beast ears afterwards. 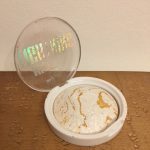 I bought the crown for €5 on eBay. 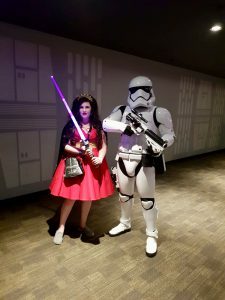 I wore two Star Wars outfits, the first of which was a porg. I love love love porgs. 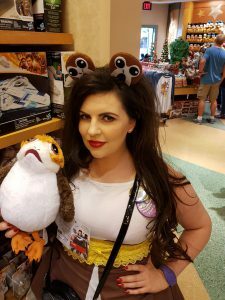 Himself made me these amazing porg ears and I paired them with a brown and white dress with a yellow belt. He also wore a Chewbacca outfit to match me. As much as I loved the ears, I really hated the dress and I was very uncomfortable. My favourite villain is the Evil Queen. She’s amazing. 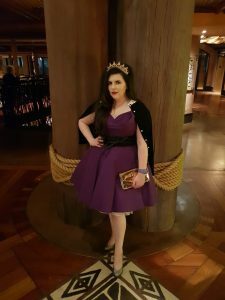 I had bought a cardigan years ago in Penneys with a white collar and I hadn’t ever worn it; it was perfect for the Evil Queen and I pinned it to my shoulders over a purple dress. I then added another eBay crown to the look. 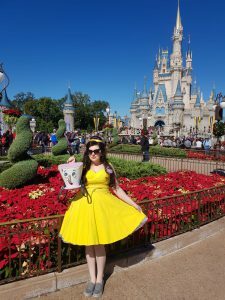 Sally is another look that I hadn’t planned on; I bought the dress in Disney and it is all kinds of fantastic. It has pockets! I made the purple ears and added them to the look. This was one of the most comfortable dresses to wear. 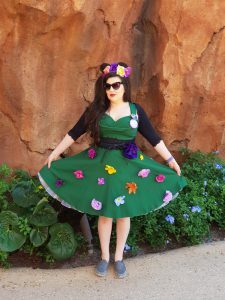 To make my Te Fiti outfit, I glued flowers to pins and attached them to the dress. I made the ears with more flowers. It is fair to say I looked bonkers. Queen Padme Amidala is one of my favourite Star Wars characters. 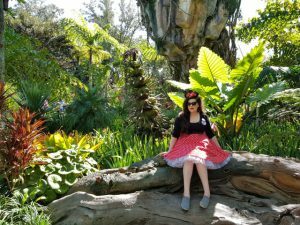 I really liked this outfit but out of all of my Disney bounds, this was the one that was lost on most people. I can understand why. When I explained it, people sort of got it but it wasn’t immediately obvious. I bought patches on AliExpress and attached them to my cardigan; I had Darth Vader and R2-D2. I found the bag on sale for €13 in the Disney shop on Grafton Street. I added a gold belt to a red dress and reused my Evil Queen crown. 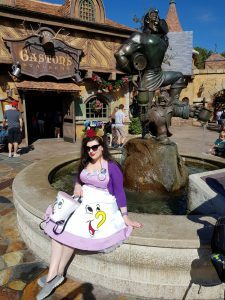 We were lucky enough to experience Dapper Day during our stay. Dapper Day is when people dress up in over the top vintage outfits. It takes place in Disney a couple of times a year and generally visitors tailor their Dapper outfits to Disney characters. As someone that is obsessed with vintage clothing and dressing up, this was quite an experience. 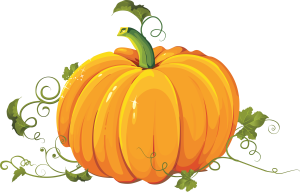 I saw so many amazing and imaginative outfits. 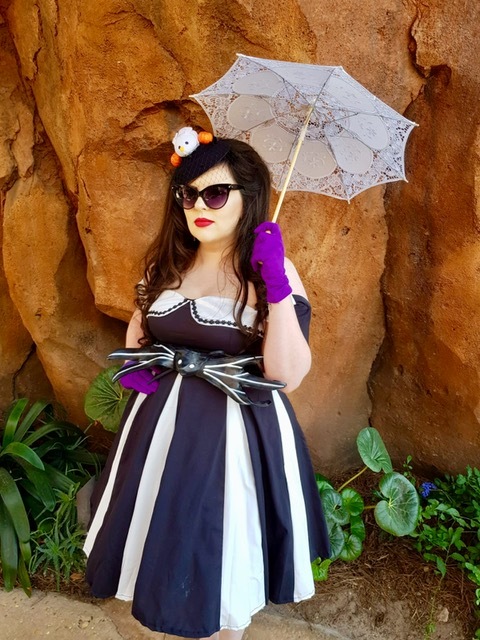 My look for Dapper Day was Jack Skellington. My dress had been made shorter as I’m not the tallest and I used the cut off material to make off the shoulder sleeves. I made a belt out of a bowtie from a Jack costume. My purple gloves are from a vintage fair that I attended years ago. I made the fascinator out of a Zero tsum tsum and some craft pumpkins. The parasol is from eBay. 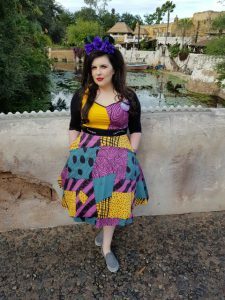 Some of these looks were incredibly bright for me as I only ever wear black and at times I was a bit uncomfortable being so colourful but overall I really enjoyed Disney bounding.